Tamiya's 1/48 MM Series has come a long way! Our 50th assembly kit model in this series is the German Sd.Kfz.250/3 Greif with its unique roof-mounted radio antenna. Produced by DEMAG, the Sd.Kfz.250 series of light half-tracks were versatile vehicles which served in a large variety of roles. Featuring 4 road wheel axles, it had better all-terrain mobility than the armored cars that it replaced. the Sd.Kfz.250/3 variant was a command vehicle equipped with long-range radio equipment for communications. This distinguishing feature of this variant was the unique frame-type radio antenna mounted on the roof of the half-track. Used by high level commanders, this AFV was notable for being the personal mount of Field Marshal Erwin Rommel in the North Africa front. 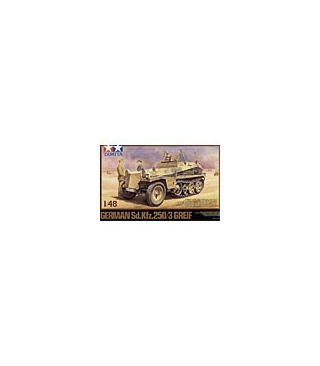 * High-quality 1/48 assembly kit model of the Sd.Kfz.250/3 half-track. * Vehicle interior features such details as crew compartment floor texture, driver's position, and radio equipment. * Convenient parts breakdown enables easy assembly of caterpillar tracks. * The number of front suspension parts is kept under control without any sacrifices to detail level. * Die-cast chassis provides a greater sense of weight and volume. * 1 figure depicting Field Marshal Erwin Rommel and 2 crew figures included. * Markings included to depict Rommel's personal vehicle. * Will be the perfect diorama match for our upcoming 1/48 Aircraft Series 100th release!